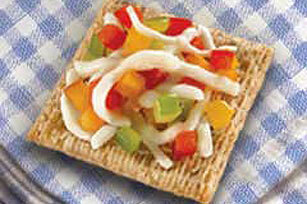 Red, green and yellow peppers give these easy appetizer crackers their color. And their cheesy appeal? That's from melty mozzarella. Place 8 of the topped crackers on microwaveable plate. Microwave on HIGH 10 to 15 sec. or just until cheese begins to melt. Repeat with the remaining topped crackers. Mix cheese mixture as directed; cover and refrigerate several hours or overnight. Spoon onto crackers just before serving, then microwave as directed. While these appetizers look best when prepared with 3 different colors of peppers, they can be prepared with any color of peppers.